It started so well. In December of 2015, newly elected Prime Minister Justin Trudeau of Canada emerged from the Paris Agreement talks as a rising climate star and a beacon of hope for global climate action. “Canada is back my friends. And we’re here to help, to build an agreement that will do our children and grand-children proud,“ said Trudeau before a crowd of cheering delegates. Following Trudeau’s Paris declaration, I continued to be cautiously optimistic. I was encouraged by his enthusiasm and dared to think that Canada’s reputation as a climate laggard was history. At first, Trudeau and the Liberal party seemed committed to fulfilling their climate election promises – phase out fossil fuel subsidies, convene provincial and territorial leaders within ninety days after the Paris talks to establish a pan-Canadian climate framework, introduce a national carbon pricing scheme, and promote the transition to clean energy. 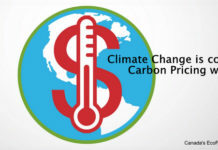 And on March 3, 2016, at a First Ministers’ Meeting in Vancouver, the federal government and provincial leaders agreed to a climate framework which included (in principle) a carbon-pricing mechanism. This would evolve into the Pan-Canadian Framework on Clean Growth and Climate Change later in 2016. In spite of this progress, little by little, the euphoria of the Paris meetings started to collide with Canada’s climate reality. How the Trudeau government would allow for the expansion of the fossil fuel industry and still honor its Paris emission-reduction commitments was the elephant in the room. And it still is today. How could the Prime Minister approve pipelines and still lead on climate? On November 29, 2016, the Trudeau cabinet approved the TransMountain (Kinder Morgan) and Line 3 pipelines while rejecting the Northern Gateway proposal. “The approvals raise grave doubts how these and additional pipelines, including Keystone XL and Energy East, can fit with Canada’s commitment to the Paris climate agreement,” said Patrick DeRochie, Energy and Climate Program Manager at Environmental Defence. I’m not sure when the Prime Minister’s transformation from Trudeau to Crudeau started. But one can be certain that the fossil fuel gods — lobbyists — descended on Parliament Hill after his Paris pro-climate declaration. The Office of the Commissioner of Lobbying of Canada shows 5,752 active lobbyists registered as of April 27, 2018, many of them from the energy and industry sectors. The most lobbied groups in Canada are by far the House of Commons and the Prime Minister’s Office. And energy and industry are among the top ten subject matters listed in mandatory monthly lobbying reports. Trudeau’s incongruous position on climate change and the fossil fuel industry had been largely ignored or kept hidden. But then the dialogue on climate policy began to change. Slowly, the public discourse about the climate began to change. At first it was quite subtle but slowly became deliberately misleading and confusing. The Prime Minister began to engage in a bewildering climate dance with the Canadian public. He spoke about the need for a pipeline to allow Alberta to get its expanding Tar Sands production to foreign markets. And according to Trudeau, pipelines will pay for the country’s transition to a green economy. The mantra of the “environment and the economy go together” became the rallying cry for Liberal Members of Parliament. According to their Prime Minister and party leader, it’s possible to be a climate leader and support the growth of Canada’s oil industry concurrently and still meet Canada’s 2030 emission-reduction targets. Claiming that we can take effective climate action and ramp-up fossil fuel production may seem delusional to most but this Liberal government does not find the two concepts irreconcilable. I witnessed this personally during my multiple meetings with Liberal Members of Parliament as a volunteer lobbyist with Citizens’ Climate Lobby of Canada over the past two years. The Kinder Morgan approval soon became the centerpiece of the energy-climate debate raging across Canada. The public conversation reached a fever pitch following the election of the NDP-Green coalition government of John Horgan. Premier Horgan is pulling out all the tools in his government’s toolbox to stop Kinder Morgan. The media and bloggers joined the fray, providing even more fodder for the growing political wildfire. 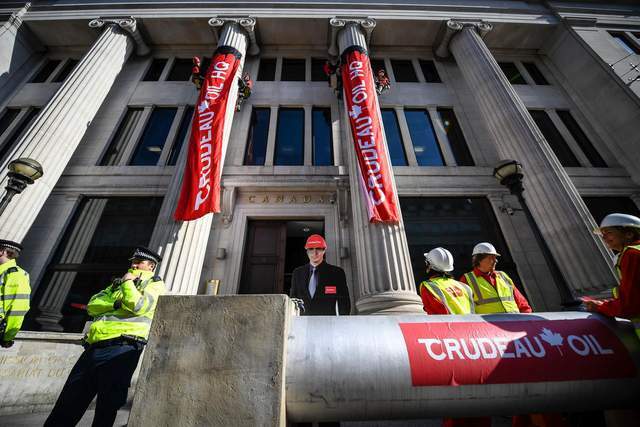 The Tyee referred to the “peak oil pipeline hysteria” in describing Alberta’s reaction to the Kinder Morgan press release saying that it will pull the plug on the project unless the governments of Canada and Alberta find a way to resolve the current impasse by May 31. Following this announcement, Alberta’s Notley went overboard crazy threatening to cut oil shipments to British Columbia, thereby exposing Alberta’s arrogant, piggish and petro-first mentality. In his Globe and Mail opinion piece, Mark Jaccard (professor at Simon Fraser University and energy-climate analyst) wrote about Trudeau’s Orwellian logic: We reduce emissions by increasing them. He refers to Trudeau’s and Notley’s accusations that BC Premier Horgan’s opposition to Kinder Morgan is “sabotaging Canada’s climate.” One has to pause here to slowly think this through. The person opposing the emissions-producing pipeline is anti-climate (Horgan) while the two who support the pipeline are pro-climate (Trudeau and Notely). One word comes to mind. Insanity. Trudeau’s slow descent into fossil fuel hell continues to this day. He has shed his climate mask and the betrayal is now complete. First there was the shifty Notley-Trudeau trade-off. In recent days, new information has surfaced that the Kinder Morgan approval was rigged. But the ultimate betrayal comes with the use of taxpayer dollars to ensure that Kinder Morgan will not pull the plug on its project. Trudeau obviously lied when he promised to eliminate fossil fuel subsidies during the 2015 election campaign. The backroom Notley-Trudeau trade-off was exposed during the ongoing confrontation between pipeline supporters and opponents. “It was absolutely part of the equation” said a beleaguered Trudeau during an interview with columnist Sandy Garossino. Rachel Notley had earlier agreed to support Trudeau’s national carbon pricing plan in exchange for Kinder Morgan. She needs a pipeline to get reelected in 2019. Without it, she’s toast. And Trudeau needs to be able to boast about Canada’s climate progress in the next federal election in October of 2019. 2. Was the Kinder Morgan approval rigged? De Souza writes “their allegation is serious: that the process was rigged following lobbying by Kinder Morgan.” During 2016, Kinder Morgan Canada lobbied federal officials “more than three dozen times…before Prime Minister Justin Trudeau announced that he was approving the Trans Mountain expansion project.” O’Gorman herself was lobbied four times during 2016 prior to issuing the “legally-sound basis to say yes” directives to senior public servants during a meeting held on October 27, 2016 reports De Souza. Justin Trudeau wants to give billions of taxpayer dollars to Kinder Morgan Canada (owned by a Texas oil company) in order to push through the Trans Mountain pipeline expansion. In doing so, my dollars and your dollars will bail out the richest most powerful and polluting industry in history. Unbelievably, “in this absurd moment, we are seriously talking about, in 2018, spending billions of taxpayer money to build a climate destabilizing pipeline,” says Klein in the video that follows. “Justin Trudeau couldn’t be more out of step with our historical moment,” she adds in a recent email to theLEAP membership. The billions in bailout money should be used to support a rapid transition to a clean energy future. A clean economy and a clean environment can go together. I cannot help but wonder what has happened to Justin Trudeau and Catherine McKenna, Minister of the Environment and Climate Change. Both started off as eager climate crusaders, warriors in the fight to tackle climate change. 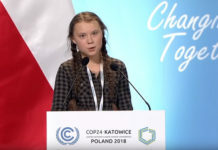 McKenna played a leadership role during the Paris climate talks. But sadly they have become oil crusaders. Because of the stronghold the oil and gas industry has on the Trudeau government, Canada is on track to fail its climate policy initiatives. Justin Trudeau and his Liberals may be in office but the oil industry is in power. This ought to make any Canadian want to regurgitate. Where’s the bucket! Indeed, where’s the bucket? And keep it close by because every week brings a new urge to reach for it. I saw this the other day. Most people don’t like thinking about climate change. But I can’t stop. And remember, the oil industry squeezes the government so that its shareholders are kept happy with a good return on their investments. If we want to do something about this, we should check where your money our money is invested. Bet most people who do invest have shares in Canada’s oil and gas. Divest asap. After all, why be part of the problem: is that not what we are accusing Trudeau of? Hi Carole and welcome to Below2C – a newbie in the Comments section. As I wrote above in my response to Pam, climate politics are intriguing and yet so, so, so frustrating to follow. Corporations have only one focus – profits. You’re right to say that the best way to influence their behaviour is through our own behaviour. And divestment works. There are only 3 ways to fight climate change – civil disobedience, boycotting oil products as much as we can and divestment. Pam – thank you for your interest in Below2C. Thank you GDK and welcome to Below2C.